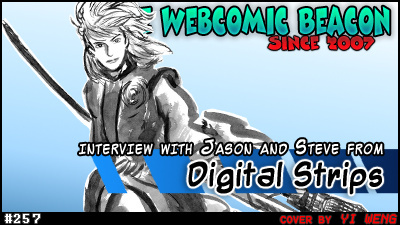 SHAMELESS PLUG: Fes of The Webcomic Beacon was kind enough to feature both Steve and I on his show, which you can listen to here. Show some love to a fellow comic podcaster and give it a spin or something. In an effort to be true in our resolution to bring you more Horizons Watches in 2013 than we did in the year prior (by our count, five, four and a half if you don’t fully count the unprecedented episode where I failed to bring one to the table), we bring you the first one of the year. With our first effort posted just before the 1st of February, that chance is alive and well. But before I get carried away, the bits that come before that are just as compelling. In Whatcha Been Readin’, I found an entire site that houses not one, not two, not three but four different comics, all by the same creator. Visit Scott Ferguson’s sites (this link will take you to one of them, from which you can get to the other three) and enjoy what appears to be high-quality work in a variety of genres (6:08). Steve, on the other hand, presents us with a comic that he admits may not be able to wholly support some otherwise good writing. Check out The Monkey and the Mouse (7:43) and decide for yourself. Never one to leave the public spotlight too soon, Ryan Estrada doles out the updates on his Kickstarter for The Whole Story (9:53) in a nearly daily fashion. The latest news informed us that this collection has been so popular, Estrada has decided to make The Whole Story a year-’round entity, housing some of the biggest and brightest names in comics today. So go get your pick from this selection and then wait for more to come, apparently very soon and very frequently. Want to hear about the oddest take on Pac-Man in that game’s illustrious, storied history? How about a hauntingly minimalistic take on the admittedly simple theme of that game? Then our chatter, backed by Israfel’s “Glass Cage” (14:00), should be right up your pellet-filled alley. Civilian by Dustin Parker (19:22) and Sidekick Quests by James Stowe (27:44) are both comics which stand on their own as early, yet promising comics with hopefully bright futures. Each has their challenges to mount in the future, but the solid foundations they share in various fundamentals bring them that much closer to realizing their potential. Man, that makes a good summation for the intention behind our Horizons Watch feature. Summarizing other, less focused elements of the podcast, we talk about They Might Be Giants by way of Tiny Toon Adventures, why it’s important to remember that everything good has already been done before, and why I’m worried that Steve had a little birdhouse put in his soul when he was young. Forget about the fact that comics have “other thinged” his body parts in the past. If you want the incredibly loose context, you’ll have to listen in! This entry was posted in Podcasts and tagged civilian, comics, digital strips, digital strips podcast, dustin parker, james stowe, jason sigler, podcast, sidekick quests, steve shinney, webcomics by The_Best_Jason. Bookmark the permalink.